USAGE: To create a water repellent surface which reduces absorption of water, oil, citrus, salt, jet fuel, organic stains, etc. into the concrete. Surface is easier to clean. Reduces etching. Pump Sprayer Information. Odorless, Water-based, Environmentally-friendly, Protects against water, oil, citrus, organic stains, Leaves natural appearance NOT a surface sealer, Has Salt Defense Technology, For Commercial or Residential applications. 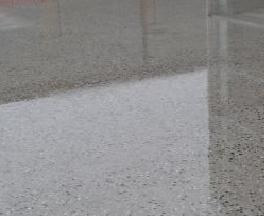 Polished Concrete: 350 -400 sq ft per gal depending on polished level. Do not dilute or alter after proper mix of concentrate. Application temperature range 35º - 85ºF (2º - 49ºC). Protect from freezing. May damage glass, aluminum, metal, ceramics & glazed tile or other surfaces. Always protect these areas. The epoxy sealer and the polished concrete sealer work just as you described. Polished concrete sealer is AWESOME! Used on a concrete countertop, applied twice, buffed it. Next day when customer saw it, applied water and it beaded immediately. Will be using lots more of this product.